My "back history" shows the vB favicons instead of the AN one. However, the tabs shows AN's favicon. If I wanted to talk about a live action anime adaptation, which forum would I do that in? Should be fixed now if you clear your caches. Works on mine, anyway. Is this still happening? I can see your posts all the way back through forever, as well as my own posts. I would guess the general off-topic forum since that's where live action movies are generally discussed but I doubt if anyone would object if you posted it in the anime forum since it is anime related. I'm not a mod or anything so this isn't official. Both are good now. Thanks. 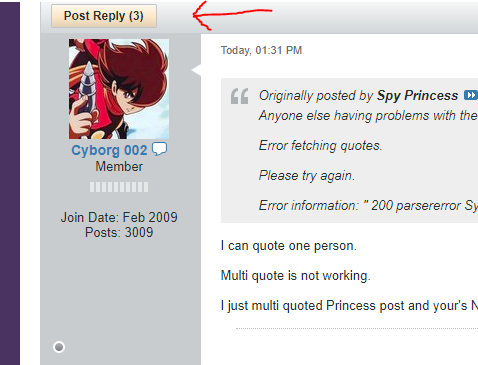 Multi-quoting seems to be broken (or is it not a feature in this forum software?). Clicking on the quote button in multiple posts causes the buttons to be highlighted, but only the first post clicked is actually quoted. Even the suggested workaround doesn't work, so... I'm thinking this is a deep bug they don't want to fix. Why, I have no idea. Seems like a simple enough fix. This tells you that you've selected 3 posts to reply to (hence the 3 in parenthesis).... click this, and it will do the multiquote. The reply area will have all the posts in it. I can quote one person. Multi quote is not working. I just multi quoted Princess post and your's Nutmeg but only Princess post is coming up. It's working now. Thanks, Nutmeg. When you multi-quote you have to use the post reply in the upper left to quote them all. Is that what you are using Cyborg 002 ? I don't ever see that, in Firefox or IE. Which AN theme are you using? I hope they keep the forums up, it is fun to read even for those who don't respond much. I use "Darker sides" which is just a copy of the default with purple sides. All the white killed my eyes. Also, I'm on Chrome and sometimes you have to scroll up a little for it to pop up. AH! Okay, so you actually have to hit the Quote button on each post, then go up and hit the Post Reply (4) button. I was hitting the checkbox on each post, which I thought selected it for multi-quoting. I didn't see the difference until I logged on with a standard user account. The checkboxes are for deleting and moving posts and whatnot. Duh! Have I mentioned that I've been out of practice with this stuff for a while? Yes you have to hit quote for each post you're quoting. I don't think it works over multiple pages though. The checkboxes are just for mods... don't give away all our secrets. Thank you. I hadn't noticed the box. As for quoting from multiple pages, I use the maximum of 40 posts per page (User Settings-->Forums tab-->Account tab), so it shouldn't be too much of a problem, and if it is, I can work around it. A smaller problem/annoyance is that the forums "swallow up" em and en dashes (delete them in the final posts), but I can work around that, too. Last edited by DocWatson; February 12th, 2019, 10:40 PM. Reason: Tested posting an em dash, then deleted the sentence, and revicsed the post. I use 40 posts per page also. It’s only a problem when what you want is at the bottom of one page and the top of another. Then it’s either copy/paste magic or double post.